The former secretary of state laughed at Kavanaugh's claim that the allegations against him are "revenge on behalf of the Clintons." 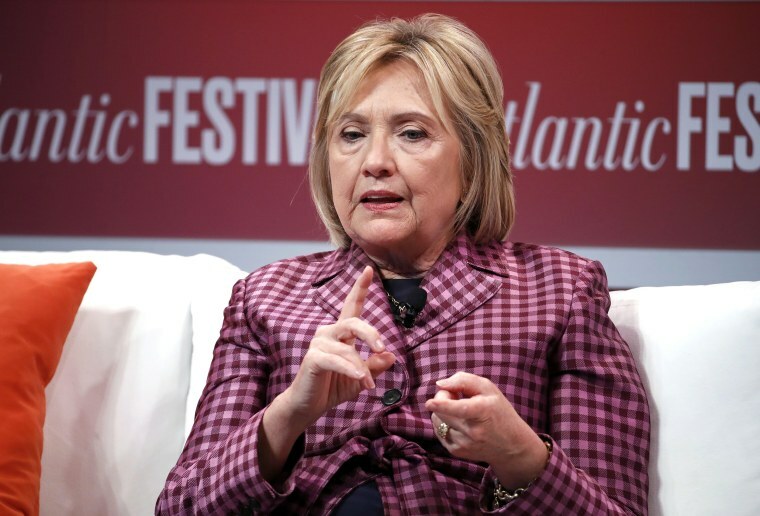 Hillary Clinton on Tuesday criticized Supreme Court nominee Brett Kavanaugh's behavior before the Senate Judiciary Committee last week as "out of bounds" and questioned his judicial temperament. "The performance, the behavior was quite out of bounds. I don't ever remember anything like that," Clinton said during a conversation with Jeffrey Goldberg, the editor-in-chief of The Atlantic, before a crowd at The Atlantic Festival in Washington. She added that she spoke as someone "who has testified under difficult circumstances," a reference to her 11-hour testimony before the House Select Committee on Benghazi in October 2015. "You were never so emotional," Goldberg said. "For 11 hours, you couldn't have been," Clinton replied. “There is such a thing that you seek in judges of a judicious temperament, people who are able to discipline themselves, to be open to the evidence wherever it might lead." Kavanaugh, in tearful, angry opening remarks to his testimony on Thursday, bluntly denied Dr. Christine Blasey Ford's allegation that he sexually assaulted her in high school. He also accused Democrats on the Senate Judiciary Committee of replacing their Constitutional "advice and consent" role "with search and destroy," while painting the allegations of sexual misconduct against him as a "calculated and orchestrated political hit" and "revenge on behalf of the Clintons." Kavanaugh once worked for Ken Starr, the independent counsel who investigated former President Bill Clinton. Clinton laughed at the accusation she and her husband were part of a conspiracy to sink his nomination. "It deserves a lot of laughter," she said, chuckling, adding that she did not watch his testimony live. "I thought it was just part of the whole of his very defensive and unconvincing presentation." She added, "I told someone later, 'Boy, I tell ya, they give us a lot of credit.'" Clinton also said she found Ford's testimony to be "very credible" and "convincing." "You have to ask yourself why would anybody they put themselves through this if they did not believe that they had important information to convey to the Senate," she said. "I felt a great swell of pride that she would be willing to put herself out there under these circumstances." The former presidential candidate also weighed in on the reopening of the FBI background investigation into Kavanaugh to probe the sexual misconduct allegations made against the judge. "I want the FBI to conduct as through an investigation as they possibly can within whatever restraints are imposed upon them," she said. "But, I think, for anyone who believes there is such a thing as a judicial temperament and that we want justices, particularly those on our highest court, to approach issues, approach plaintiffs and defendants with a sense of fairness, there's a lot to be concerned about."